Springtime inspires creativity in me, and so I’ve been ready to experiment a bit. 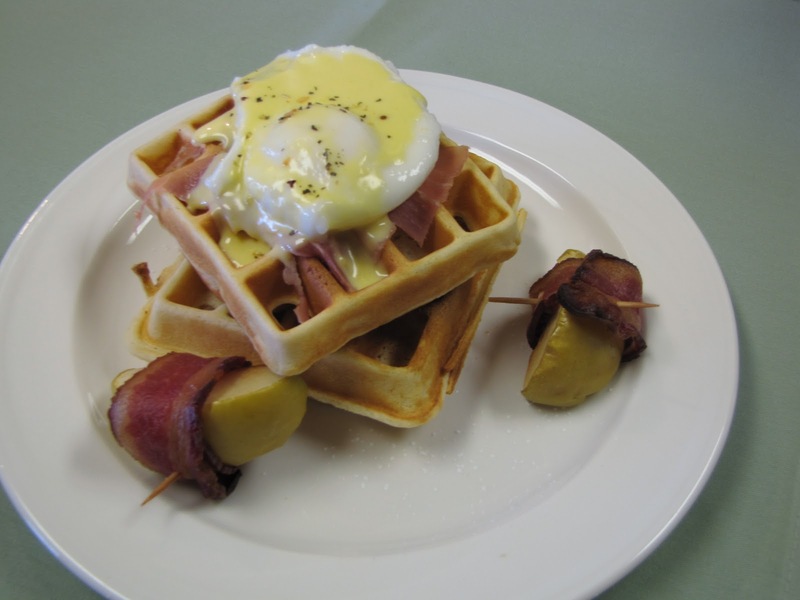 Today we tried a twist on the familiar Eggs Benedict, replacing waffles for the English muffins. Since prosciutto makes absolutely everything taste better, we substituted prosciutto for the Canadian bacon. It was so yummy, and enjoyed by our guests. Serving suggestion: smoked applewood bacon wrapped apples. Yet another YUM! For the waffles: sift the dry ingredients together. In a separate bowl, combine milk, oil, and egg yolks. Stir liquids into dry ingredients just until blended. Fold in the beaten egg whites. Cook on hot waffle iron until golden brown. Stack two waffles. Top with a slice of prosciutto. Top with one poached egg. Cover egg with a small ladle of hollandaise sauce. Sprinkle with mediterranean spiced sea salt. Hollandaise sauce: in a small saucepan, whisk egg yolks and lemon juice. Add 1/4 cup butter, and place on lowest heat, stirring until the butter is melted. Add the remaining 1/4 cup butter, and whisk continuously over very low heat. Continue cooking and whisking until the sauce thickens, cooking slowly so as to not curdle the eggs. Tip: if the sauce cools and thickens too much, add a tablespoon of boiling hot water and whisk, repeating as necessary.